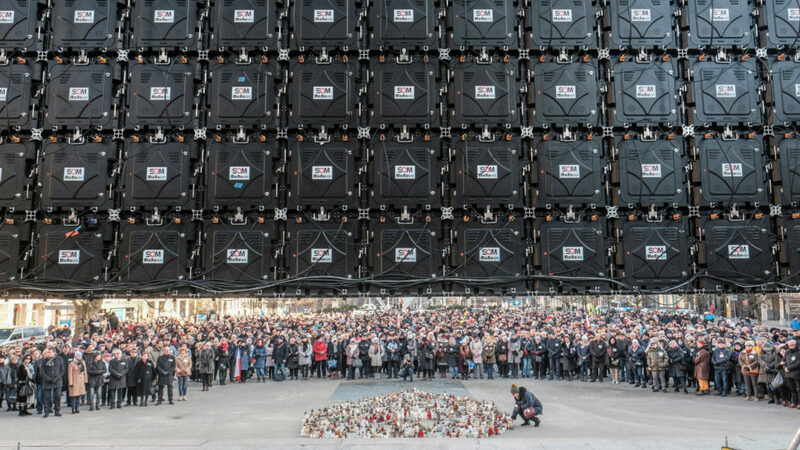 WARSAW, Poland — Krzysztof Strzemeski watched with unease as a high school friend voiced support for Poland’s nationalist government on social media, followed by hate-filled extremist posts. But when the liberal mayor of Gdansk was stabbed to death in public in January, he could no longer hold back his anger. “Congratulations for your perseverance sharing right-wing filth,” the 58-year-old university lecturer wrote to his former classmate. The two haven’t communicated since. Poland’s political fissures have widened in recent months, pitting conservatives — many of them government supporters — against liberal critics who accuse the ruling party of threatening the country’s hard-won democracy by undermining the independence of the judiciary and the media. In this toxic atmosphere, there has been an increase in hate speech, political threats and, most stunningly, the assassination of popular Gdansk Mayor Pawel Adamowicz, a critic of the ruling Law and Justice Party’s anti-immigrant policies. After stabbing Adamowicz during a Jan. 13 charity event, the attacker grabbed a microphone and said that was his revenge against an opposition political party that Adamowicz had once belonged to. Although there have been suggestions the assailant also had psychological problems, some government critics blamed Poland’s heated political discourse, some of it from state television. Commentators had often vilified Adamowicz for his open acceptance of refugees and gays, and his widow said he had been getting death threats, causing the family to live in fear. Poles have long spoken of “two tribes” in their central European country. Now, increasingly there is talk of a “Polish-Polish war” — a divide that is greater than at any time since the 1980s, when the Soviet-backed Communist regime tried to crush the Solidarity freedom movement by imposing martial law. The wedge issues that Poland faces are familiar in many other places: immigration and borders, abortion, the relationship of the nation’s mostly Catholic society to Jews, Muslims and other faiths, and the rights of gays and women. On one level, it seems to be a microcosm of the political struggles elsewhere in Europe and in the United States. But Poland is also one of the European Union’s largest and most economically dynamic countries, and its course will help shape the continent’s future. Poland’s current government has aligned itself with other populist, conservative or nationalist figures — U.S. President Donald Trump, Israeli Prime Minister Benjamin Netanyahu and Hungarian Prime Minister Viktor Orban. The Law and Justice Party won the 2015 election amid Europe’s migration crisis and a weariness with the centrist government that had been in power for eight years. Party leader Jaroslaw Kaczynski vowed more help for the poor, a tough anti-corruption stance and a hard line against Muslim migrants, who he said carried “parasites and protozoa” dangerous to the native European population. After mass street protests against his party’s plans to overhaul the judicial system, Kaczynski turned his language against internal critics, referring to protesters as “the worst sort of Poles” and “national traitors.” His language was widely denounced as reminiscent of the worst of the last century in Europe. Last year saw a surge in anti-Semitic rhetoric in Poland after the passage of a controversial Holocaust speech law. Some of that was spoken even by public officials and TV commentators, creating a new normal in what seems to be acceptable speech. On Jan. 27, International Holocaust Remembrance Day, a far-right activist who had been imprisoned for burning an effigy of a Jew in 2015 staged a protest outside the Auschwitz memorial site, saying it was time to “fight Jewry.” Holocaust survivors had gathered for solemn observances not far away. Muslims, while only a tiny percentage of Poland’s population, have increasingly been taunted, spat on and even assaulted, according to the Never Again association, which monitors such crimes. Since Adamowicz’s killing, prosecutors have faced criticism for failing to investigate death threats against politicians. 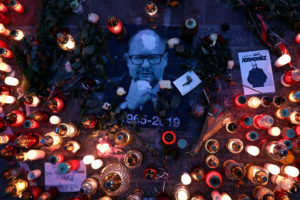 Two weeks before his death, the public prosecutor halted proceedings into symbolic “political death notices” that the far-right group All-Polish Youth issued for Adamowicz and 10 other mayors who had pledged support for the integration of migrants. There also have been dramatic calls on all sides for reconciliation. Prime Minister Mateusz Morawiecki has met with opposition leaders and urged more “mutual respect” in public debate. But state television continues to vilify ideological opponents. Marcin Makowski, a conservative journalist and commentator, said he believes it’s unfair to put all the blame on the government, recalling instances of harsh political rhetoric used by its opponents that fanned hatred and in some cases seemed to call for violence. When Kaczynski’s brother, President Lech Kaczynski, died in a plane crash in 2010, some even joked about it, Makowski recalled. “None of them are saints and pretending as such is pure hypocrisy,” Makowski said.